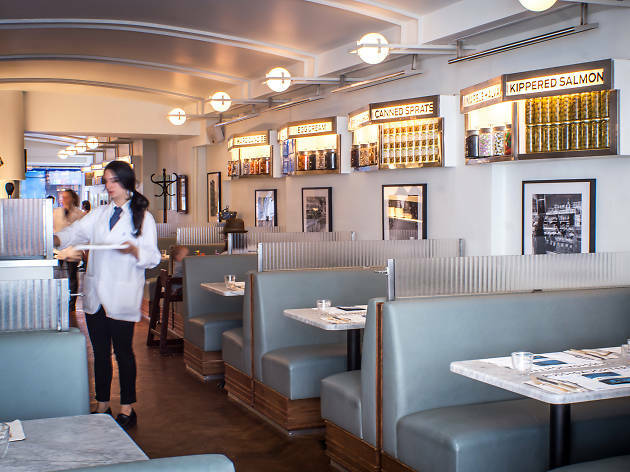 The heralded lox emporium—a Lower East Side staple since 1914—serves old-world standbys like borscht, smoked-fish platters and egg creams at this nearby full-service restaurant complete with retrofitted signage, formica tables, and geniune haimish warmth. 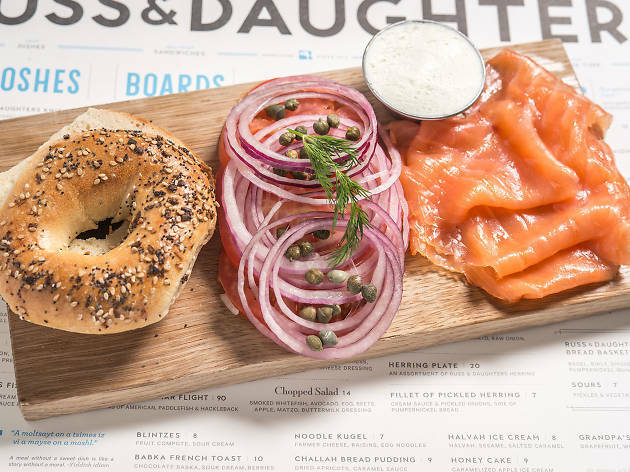 If you don't love lox, this isn't the restaurant for you. 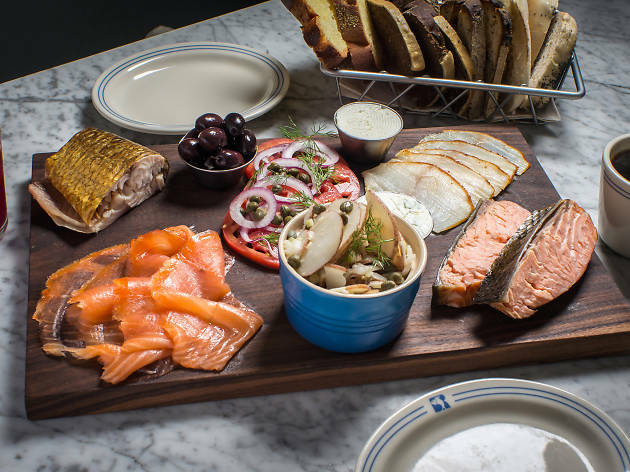 That's not meant to be a reason to stay away, there's plenty of non-lox dishes you can enjoy, but the main reason to come here is for the fish. It's fresh, the cures are incredible, and you'll be dreaming about it for days. 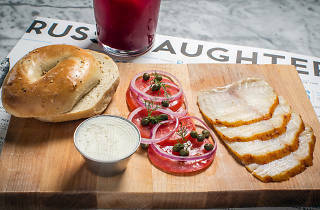 Russ & Daughters is best for brunch. 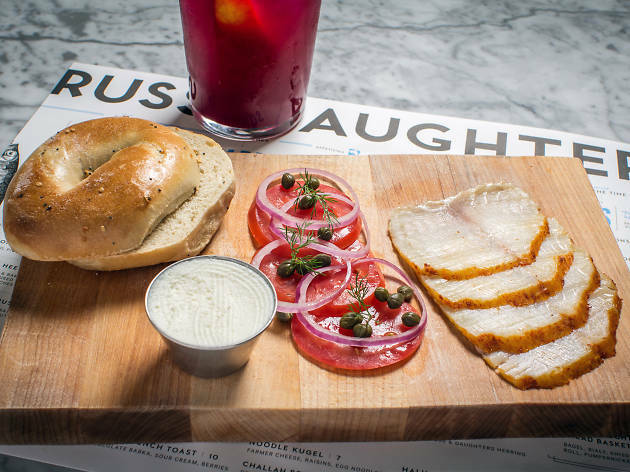 The platters easily feed four people, so it's a great group brunch option as long as you're prepared to wait. 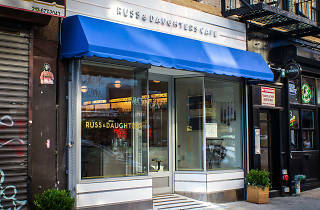 I didn't get to try the babka french toast, but I can't wait to - it looks AMAZING. I'd definitely recommend visiting here and coming back again and again. Waited 45 minutes on MLK day but it's convenient that they send you a text when your table is ready. 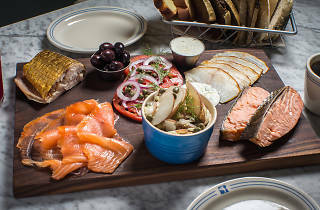 The Super Heebster ( picture attached) was our favorite dish, with a mix of smoked whitefish and salmon salads and horseradish dill cream cheese that balanced out of the smokey flavor. We also got the Lower Sunny Side and Eggs Benny which were great, however this is a place I would go for the Noshes and Boards over the eggs. 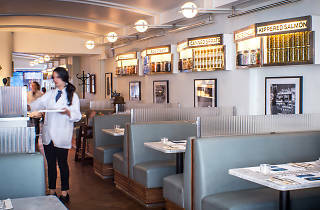 Underwhelmed by the Bloody Mary, but overall great, cute, diner feel with good service. I took my mom for brunch, and although we waited for almost an hour, it was totally worth it. 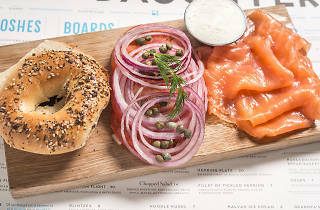 As usual the bagel with smoked salmon platter was perfect, the mimosas were very good, the eggs were fluffy and the chocolate babka to die for. 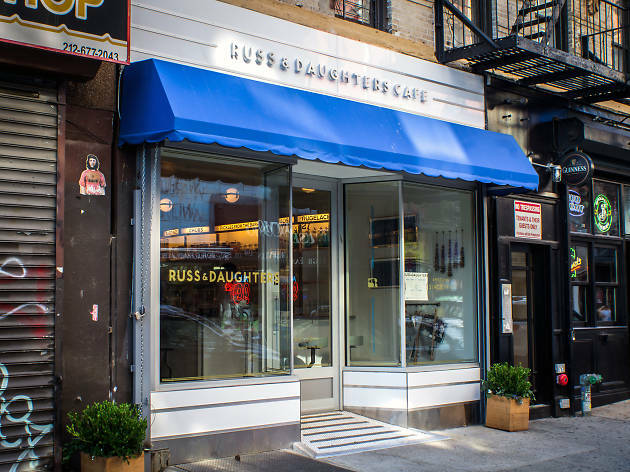 I recommend avoiding peak hours like weekend brunch, and if you have to wait too long I walk a few streets over the original Russ and Daughters and get the bagel to go!.